The Montecristi semi-calado has vent holes woven in and an open weave crown. It is a Montecristi hat woven in Montecristi Ecuador but with vent holes woven into the otherwise airtight weave pattern. This elegant and mostly unique weave design permits a much greater airflow through the top of the crown. This style keeps your head the coolest of all panama hats due to the extra airflow. It's built for extreme weather conditions! Since there are so many different types of patterns of the vent holes woven into the crown, this is generally only available in our stock items on an individual basis as stock is available. So if you see one you like, you better grab it up ASAP! 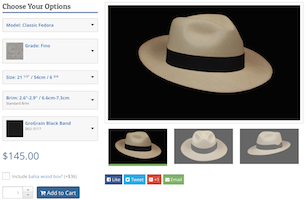 Sub-fino Panama hats are our most basic type of hat with a weave that is still of great quality, but not as tightly woven as the other grades. Serious Sun Protection: Larger brims tend to start looking more western, which is great for Texas! Or a Texan at heart! Snap brim on the front causing the brim to tip downward slightly. With the weight of this long brim it will want to tip down in the back as well and be just a little floppy in the wind. If you add a curl to the edge it will hold its shape much better. Even if it is just a small curled edge, it will give it much more rigidness. Brim size is a hard thing to recommend because many factors play a part in your selection, such as where you live and the culture, in addition to your personal preferences. I would say this brim will be about as good as it gets for protection from the sun. Larger brims many not offer more protection since the shade that this brim casts is already pretty much 100% coverage . Send us your question about this Montecristi Sub Fino Classic Fedora hat, and we will respond to you as soon as possible. What month will it be next month?